Sonderling Sunday – Der Lorax, BIGGER! It’s been almost two months, but it’s time for Sonderling Sunday! That time of the week when I play with language by looking at the German translation of children’s books. This week, I don’t have much time, but I’m going to do a little bit anyway! Tonight we’ll look at Der Lorax. This one’s fun because it’s poetry, so I’ll usually do a section at a time and then give a more direct translation from the German back to the English, so you can see how things were changed to make them more poetical. Last time, we left off as the Bar-ba-loots sadly walked away because the Thneed business needs to grow. I went right on biggering . . . selling more Thneeds. = Ich wollte nichts Böses, auf gar keinen Fall. Doch der Laden muss wachsen, so ist das nun mal. Es wuchs die Fabrik, es wuchsen die Kisten. nach Osten, nach Süden, nach West oder Nord. Es wuchs einfach alles, das Geld wuchs auch. Und Geld is etwas, das jedermann braucht. (“I wanted nothing evil, absolutely no way. But the shop must grow, and that’s simply that. It grew the factory, it grew the crates. from the east, from the south, from the west or north. It grew simply everything, the money grew also. My favorite rhyme in that previous section is definitely Kisten rhymed with Schnauchbestellungslisten. kam dieser Lorax, um wieder zu jammern. “‘I am the Lorax,’ he coughed and he whiffed. ‘Once-ler!’ he cried with a cruffulous croak. ‘Once-ler! You’re making such smogulous smoke! My poor Swomee-Swans. . . why, they can’t sing a note! = „Ich bin der Lorax.? Er schnappte. Er schniefte. Er nieste und japste und keuchte und piefte. „Einstler?, rief er, jetzt heulte er auch. „Einstler, du machst so rußigen Rauch! Meine Schwippschwäne bringen kein Lied mehr heraus. Diesen Smog in der Kehle, den halt niemand aus.? I don’t think the translator is making up as many words, but they did get a nice rhythm to the lines. Google Translate says that rußigen Rauch means “sooty smoke” — so if it’s not quite smogulous, well, it’s getting there. aus dreckigen Rohren, der Schlabberpapp.? ‘is this bad Schlickerschlamm (silty-mud). = Ich will noch viel mehr, und zwar jetzt und hier. weil jeder, JEDER einen braucht! (“I want a lot more, and that here and now. Instead of “smoke-smuggered stars,” we’ve got verpesteten Ort (“pestilential place”). Instead of “UNLESS,” the pile of rocks says ES SEI DENN (which seems to mean the same thing). = Der letzte Trüffelasamen von allen! etwas, was wirklich jeder braucht. klares Wasser, frische Luft, viel Pflege und Licht. schütz ihn vor Äxten, sei auf der Hut! Das ist dein Auftrag, du schaffst das, viel Glück! something that really everyone needs. clear water, fresh air, much care and light. protect it from axes, be on your guard! That is your job, you can do it, good luck! Look! I finished a book! I went longer than I meant to, but in doing so I biggered my fun. 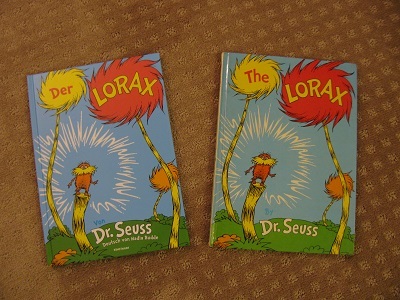 This week, I’m going to take another look at Der Lorax, by Dr. Seuss. Last year, I found a German version of this classic when I shopped at Powell’s in Portland, and I looked at the beginning of the book, and then the second part. It is time to push onward! With The Lorax, it’s fun to do sections at a time, because this is poetry! I’ll include the original, the translation, and then give an idea of how the translation reads, literally. I had just finished the part where the Once-ler had laid out his Thneed Scheme. ‘I’m busy,’ I told him. den die Bäume sind stumm!? und schrei nicht so rum.? for the trees are silent! I like it when the translator makes up words. Since, after all, Dr. Seuss does the same. for the whole Once-ler Family to get might rich! ein Funktelefon, in null Komma nix. Ich rief meine Brüder und Onkel und Tanten. „Ich hab sie, die Chance für alle Verwandten! Die Einstler-Familie wird saumäßig reich! biegt ab bei Hühhotten, scharf rechts bei Südschleich.? a radio-telephone, in zero point zero. I called my brothers and uncles and aunts. ‘I have for you the chance for all the relatives! The Onceler Family will be lousy rich! zum Takt der Axt, die die Bäume hackte. Der Laden fing zu brummen an! war mir viel zu lahm. Schnell erfand ich das Super-Axt-Abhackmobil. Das fällte die Bäume, gleich viermal so viel! The shop started to grow! was for me much to lame. Quickly invented I the Super-Axe-Hack-Down-Mobile. die du schneidest mit deinem Hackebeilschnitt. und immer genügend zu essen hatten. sitzt den Braunfelliwullis der Hunger im Nacken. Die armen Kleinen, was sollen sie machen? Mit knurrendem Magen gibt’s nichts zu lachen.? which you cut with your Cleaver-Cutter. and always enough to eat had. sit the Brown-felli-woolies with hunger in their necks. The poor littles, what shall they do? You can’t do anything about that. I’ll stop there for tonight! Now you know a slightly more polite way to shut someone up! und schrei nicht so rum. Sonderling Sunday – You Need a Schnauch! It’s time for Sonderling Sunday, that time of the week when I play with language by looking at the German translation of children’s books. This week, I’m going to dive back into Der Lorax, von Dr. Seuss! Last time, we left off when the Einstler had just seen die Bäume! Die Trüffelabäume! = Im Schatten der Bäume sah ich Braunfelliwullis. und naschten von den Trüffelanüssen. (“In the shadow of the trees saw I Brown-felli-wullis. Oh, alas! The first two lines of this are lovely, but the next two lines? Well, it’s a noble effort, but the German lines don’t have the same rhythm as the original. Doch die Bäume! Diese Bäume! “In no time at all, I had built a small shop. ein Laden gebaut und ein Baum abgehackt. Aus dem kuschligen Tuff strickte ich einen Schnauch. a shop built and a tree hacked down. “The instant I’d finished, I heard a ga-Zump! = Und grad war ich fertig, da machte es plumpf! aus dem Baum, den ich fällte. Es war so ein Mann. Ihn beschreiben? Ich weiß nicht, ob ich das kann. “He was shortish. And oldish. = Ich sprech’ für die Bäume, den die können’s ja nicht. “I’m being quite useful. This thing is a Thneed. = Ich mache mich nützlich. Dieses Ding is ein Schnauch. Und ein Schnauch ist etwas, was jedermann braucht. Man nimmt ihn als Pulli, als Socke, als Kragen. Ein Schnauch ist sehr praktisch, sozusagen. als Vorhang, als Kissen oder Fahrradsitzmütze. (“I’m making myself useful. This thing is a Schnauch. And a Schnauch is something, that all people need. One takes it as a pullover, as a sock, as a collar. A Thneed is very practical, so to speak. “I laughed at the Lorax, “You poor stupid guy! = Ich lachte: Du Dummkopf, jetzt hör auf zu schnaufen! Man weiß eben nie, was die Leute so kaufen. That’s it for this week! In general, the translator, Nadia Budde, did come up with lines that still roll off the tongue. It’s time for Sonderling Sunday! That time of the week when I play with language by looking at the German translation of children’s books. And look what I found at Powell’s books in Portland! A copy of Der Lorax! It’s been many weeks since I last did Sonderling Sunday. No, I’m not going to let it fall by the wayside. But I’ve had a busy summer, including a wonderful vacation in Oregon. And I haven’t posted on my website much lately, because this week my computer broke. But I’ve managed to restore the operating system, and I’m hoping to spend my Labor Day restoring files. And fortunately, I can post Sonderling Sunday without having my files back. While I was in Oregon, I visited my oldest son Josh, and we went to Powell’s Books in Portland. I had no idea they had a small German section — and I found Der Lorax. Later, my younger son Tim and I had a marvelous time taking turns reading pages of the whole thing aloud. He reflected that it’s probably not as hard as you might think to translate Dr. Seuss — a lot of his words are invented, so just invent a word that rhymes as needed. You’ll see what he means…. And the translation is done by Nadia Budde. I like the places where they had to put words in the pictures. “The Street of the Lifted Lorax” fits much more neatly than Weg des Entschwundenen Lorax. liegt der Weg des entschwundenen Lorax. = Was war der Lorax? Und wohin entschwand er? Denn jetzt ist er fort. “You won’t see the Once-ler. Er haust ganz oben bei schummrigem Licht. He lives at the top in dim light. Hmm. She didn’t even try to translate “Lerkim.” Not as many made-up words, but it does give the feeling of the Once-ler’s Lerkim. wird oben der Sehschlitz größer gemacht. saust das Flüsterfon ran an dein Ohr. Das Einstler-Genuschel kriecht mühsam durchs Rohr. rushes the Flüsterfon to your ear. The Einstler-Genuschel crawls laboriously through the tube. und die Schwippschwäne sangen, der Wind trug es fort. Da kam ich an diesen herrlichen Ort. Und ich sah die Bäume! die knallbunten Tuffs in der Morgenbrise. and the Schwipp-swans sang, the wind carried it away. There came I to this glorious place. And I saw the trees! Well, it’s getting late, and I haven’t gotten very far. So I will save the rest for another day. May you experience grün Gras, weiß Wolken, und ein Teich herrlich nass. But this is about Dr. Seuss. Dr. Seuss is one of those writers who is such a stand-by, such a basic, you almost don’t think of him when you’re thinking about top picture books. And he has so many classics, it really spreads out the votes. Here’s my own review of The Sneetches. I’m with Carol! On Read Across America one year, I read Fox in Socks as quickly as I could. My oldest son learned to identify the letter O from this book at the amazing age of 15 months.